I don’t read enough self-published books. I get so caught up in the new release cycle of traditional publishing, that indie gems tend to slip under the radar. 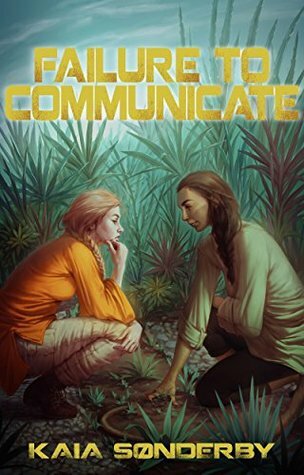 Such is the case with Failure to Communicate, a delightful sci-fi first contact novel with an autistic, bisexual protagonist and a subtle polyamourous romance. Xandri Corelel was born during a brief phase for non-genetically altered children. That phase ended as soon as parents figured out that some of those children were neurodivergent in a society that had long since used genetic engineering to erase all sorts of neurodivergence. Xandri, as one of the few autistic people in the universe, hasn’t had an easy life, but she’s found a home as the head of Xeno-Liaisons on the Carpathia, an extra-governmental spaceship that specializes in first contact missions. Learning to decode the social systems and body language of other humans has taught Xandri incredible powers of observation that make her excellent at her job. However, all of Xandri’s skills are to be put to the test when her presence is requested for negotiations with the Anmerilli, a notoriously xenophobic species who have the plans for a universe-changing weapon. Xandri isn’t a diplomat, but forging an alliance with the Anmerilli is now in her hands. Failure to Communicate has an engaging storyline and characters. I was immediately sucked into the plot and world, and it was so so easy to promise myself “just one more chapter” time after time. I really enjoy science fiction stories with aliens and first contact, so Failure to Communicate was right up my alley. The aliens weren’t the best I’ve ever seen (I love when fictional aliens aren’t just humans in a costume), but Failure to Communicate was using the aliens more to comment on our own world than to explore “what if” questions regarding alien life. I haven’t seen much Star Trek, but I think Failure to Communicate would appeal to a similar audience. The Anmerilli resemble humans in many ways, which is why humans are the only species in the pan-galactic alliance that they’ll allow onto their planet. The major sticking points in the negotiations on the Anmerilli joining the alliance involve animal cruelty (raising megafauna for recreational hunting) and the prevalence of weapons, which at one point is directly referenced in regards to “America of ancient earth” and gun control. Failure to Communicate imagines a future where humanity has restored Earth’s environment and solved many problems regarding violence — but our current problems are projected onto an alien species and planet. Of course, not everything’s bright and wonderful in this imagined future. Very often, science fiction novels and stories will insist that disabled and neurodivergent people don’t exist in their future, claiming that these “problems” have been solved. The whole thing reeks of eugenics, and it’s something that’s a reoccurring problem with how the science fiction community treats disabled people. Failure to Communicate is addressing this head on, giving us an autistic protagonist who also has synesthesia. Xandri has to deal with lots of microaggressions and outright hostility and bigotry from some of the other characters. Again, these are problems that relate just as much to our present as to an imagined future. It’s worth noting that the author is also autistic and that Failure to Communicate is ownvoices in terms of autistic representation. I loved Xandri’s lowkey polyamourous romance plotline (it didn’t dominate the narrative). I said earlier in the review that Xandri was bisexual, but she could also be pansexual — no labels are ever used. I’ve only got two real criticisms when it comes to representation/diversity issues in Failure to Communicate. The first is that food terms were sometimes used to describe the characters of color’s skin, which can be a bit iffy. Secondly… this is probably getting into spoilers so maybe skip the rest of the paragraph… I haven’t seen any other reviews address this, but I think the bipolar representation is probably bad. I understand in this case the character being bipolar is used as a humanizing factor and not part of this character being a villain, but it’s still not something I’m entirely comfortable with. Personally, I wouldn’t give Failure to Communicate to a bipolar friend. But I’m not bipolar myself, so if you see any bipolar reviewers discussing this, listen to them over me. That caveat aside, I really enjoyed Failure to Communicate. I plan to read the sequel! Hopefully sometime in 2019. Fingers crossed! I’d also recommend the prequel (Testing Pandora). It isn’t a full novel, but I found it really – well, touching, since it actually goes into how Xandri is “found” and joins the crew. The sequel I hated unfortunately. And I know that’s a strong word but when your hopes are mercilessly crushed like this it seems appropriate, ha. But I’ll keep much mouth shut as to why; maybe it’s just me (seems to be more often than not the case…). Lines are constantly blurring anyway, though. And I see more previously traditionally published authors simply ditching their publishers and doing their own thing for various reasons. And yeah. When I say that I don’t read enough indie stuff, I mean that I don’t read enough indie stuff that’s already got good reviews. I want to help new authors out, but I’m already doing slush reading for work, I’m not doing it during my pleasure reading time too.